WASHINGTON, DC – A record US$991.2 billion in illicit capital flowed out of developing and emerging economies in 2012—facilitating crime, corruption, and tax evasion—according to the latest study released Tuesday by Global Financial Integrity (GFI), a Washington, DC-based research and advisory organization. 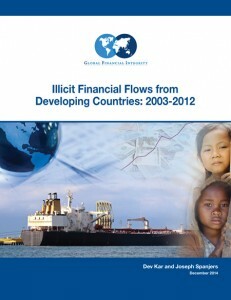 The study is the first GFI analysis to include estimates of illicit financial flows for 2012. The report—GFI’s 2014 annual global update on illicit financial flows—pegs cumulative illicit outflows from developing economies at US$6.6 trillion between 2003 and 2012, the latest year for which data is available. Titled “Illicit Financial Flows from Developing Countries: 2003-2012,” [HTML | PDF] the report finds that illicit outflows are growing at an inflation-adjusted 9.4 percent per year—roughly double global GDP growth over the same period. Authored by GFI Chief Economist Dev Kar and GFI Junior Economist Joseph Spanjers, the study reveals that illicit financial flows hit an historic high of US$991.2 billion in 2012—marking a dramatic increase from 2003, when illicit outflows totaled a mere US$297.4 billion. Over the span of the decade, the report finds that illicit financial flows are growing at an inflation-adjusted average rate of 9.4 percent per year. Still, in many parts of the world, the authors note that illicit flows are growing much faster—particularly in the Middle East and North Africa (MENA) and in Sub-Saharan Africa, where illicit flows are growing at an average annual inflation-adjusted rate of 24.2 and 13.2 percent, respectively. Totaling US$6.6 trillion over the entire decade, illicit financial flows averaged a staggering 3.9 percent of the developing world’s GDP. As a share of its economy, Sub-Saharan Africa suffered the largest illicit financial outflows—averaging 5.5 percent of its GDP—followed by developing Europe (4.4 percent), Asia (3.7 percent), MENA (3.7 percent), and the Western Hemisphere (3.3 percent). The US$991.2 billion that flowed illicitly out of developing countries in 2012 was greater than the combined total of foreign direct investment (FDI) and net official development assistance (ODA), which these economies received that year. Illicit outflows were roughly 1.3 times the US$789.4 billion in total FDI, and they were 11.1 times the US$89.7 billion in ODA that these economies received in 2012. For a complete ranking of average annual illicit financial outflows by country, please refer to Appendix Table 2 of the report on page 28. The rankings can also be downloaded here [Excel]. An alphabetical listing of illicit financial outflows is available by year for each country in Appendix Table 3 on pg. 30 of the report, or it can be downloaded here [Excel]. The United Nations should adopt a clear and concise Sustainable Development Goal (SDG) to halve trade-related illicit financial flows by 2030 and similar language should be included in the outcome document of the Financing for Development Conference in July 2015. There are no methodological changes between this report and GFI’s 2013 annual update. To conduct the study, Dr. Kar and Mr. Spanjers analyzed discrepancies in balance of payments data and direction of trade statistics (DOTS), as reported to the IMF, in order to detect flows of capital that are illegally earned, transferred, and/or utilized. Data for Iraq were unavailable in 2003-2004, thus the average illicit outflows of US$11.14 billion reflect only the years 2005-2012. Likewise, Iraq’s cumulative outflows of US$89.10 billion are cumulative outflows for 2005 through 2012 only. Data for Brunei were not available in 2010 and 2011, thus the average illicit outflows of US$4.30 billion reflect only the years 2003-2009 and 2012. Likewise, the cumulative outflows of US$42.99 billion for Brunei are cumulative outflows for 2003 through 2009 plus 2012 only. Click here to read an HTML version of this press release on our website. A PDF of this press release can also be downloaded here [PDF]. More information about the GFI report is available on the GFI website here. A PDF of the full report can be downloaded here [PDF]. All report data can be downloaded here [Excel]. A tip sheet for journalists can be downloaded here [PDF]. An Excel spreadsheet with full country rankings by average annual illicit financial flows is available here [Excel]. An Excel spreadsheet with country rankings by 2012 illicit financial flows is available here [Excel]. An alphabetical listing of total illicit financial flows data for each country and each year is available here [Excel]. To schedule an interview with Mr. Baker, Dr. Kar, Mr. Spanjers, or other GFI spokespersons on this report, contact Clark Gascoigne at +1 202 293 0740, ext. 222 (Office) / +1 202 815 4029 (Mobile) or cgascoigne@nullgfintegrity.org. On-camera spokespersons are available in Washington, DC. All monetary values are expressed in U.S. dollars (USD). Global Financial Integrity (GFI) is a Washington, DC-based research and advisory organization working to curtail illicit financial flows by producing groundbreaking research, promoting pragmatic policy solutions, and advising developing country governments.